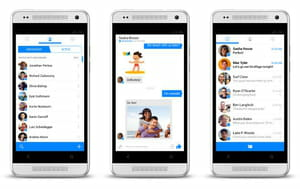 Facebook Messenger is an application that allows users to instantly chat with their online Facebook friends, adding stickers and emoticons to the conversation if they'd like. It also enables them to record and receive voice messages, among other functions. Although this app is most suitable for instant messaging, users are also notified when they receive Facebook notifications that aren't messages; when they click the notification bubble, they are automatically transported to the main Facebook app. Latest update on February 1, 2017 at 05:07 AM.